The new Percussion Plus PP3500 features high-quality 9-ply cross laminated wooden shells for superior warmth and projection. With double-braced hardware, high quality Remo drumheads, deep power toms, and a dazzling array of striking finishes, this drumset is an amazing value for the beginning or advancing drummer! The set includes a 16x22 kick drum, 10x12 rack tom, 11x13 rack tom, 16x16 floor tom, and 5.5x14 metal snare drum! 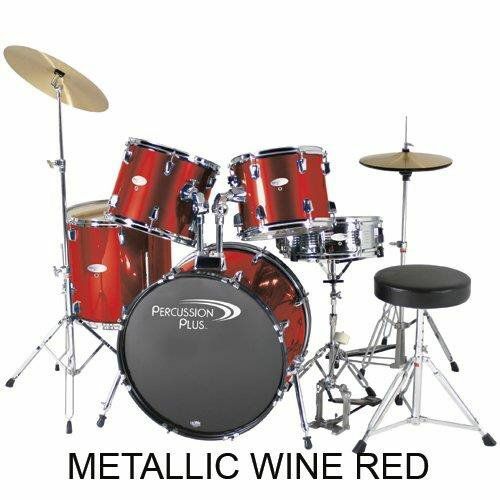 It also comes with a full set of double braced hardware including a snare drum stand, hi hat stand, straight cymbal stand, heavy duty single spring/chain bass pedal, and padded drum throne. To round out this complete setup, 14" hi hats, a 16" crash cymbal, drum key and drum sticks are included. 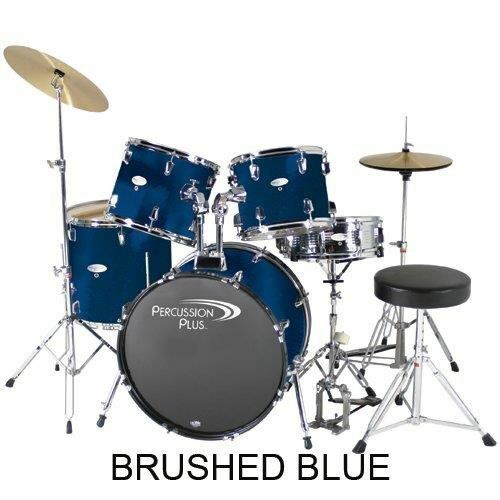 The PP3500 is a high quality drum kit complete and ready to play. With a full-sized 5-piece setup, this drumset is a great choice for advanced drummers to beginners looking for a set that will last for years. Everything you need to get started, right out of the box! The new Percussion Plus PP4100 features high-quality 9-ply cross laminated wooden shells for superior warmth and projection. With double-braced hardware, high quality Remo drumheads, deep power toms, and a dazzling array of striking finishes, this drumset is an amazing value for the beginning or advancing drummer! The set includes a 16x22 kick drum, 7x10 rack tom, 8x12 rack tom, 14x16 floor tom, and 5x14 wood snare drum! It also comes with a full set of double braced hardware including a snare drum stand, hi hat stand, straight cymbal stand, heavy duty single spring/chain bass pedal, and padded drum throne. To round out this complete setup, 14" hi hats, a 16" crash/ride cymbal and drum key are included. The PP4100 is a high quality drum kit complete and ready to play. With a full-sized 5-piece setup, this drumset is a great choice for advanced drummers to beginners looking for a set that will last for years. The set includes a 16x22 kick drum, 7x10 rack tom, 8x12 rack tom, 14x16 floor tom, and 5x14 wood snare drum! It also comes with a full set of double braced hardware including a snare drum stand, hi hat stand, straight cymbal stand, heavy duty single spring/chain bass pedal, and padded drum throne. To round out this complete setup, 14" hi hats, a 16" crash cymbal and drum key are included.